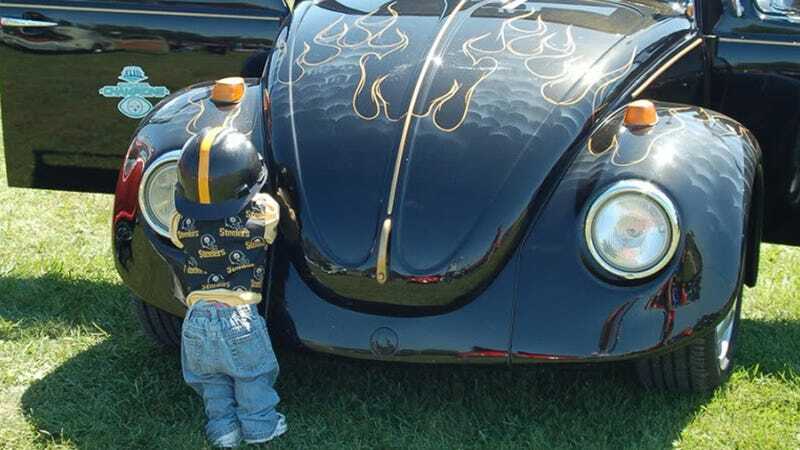 Life wouldn't be worth living if not for mystery, but there's one I just can't cipher: Why do classic car owners prop life-size dolls of toddlers against their rides at shows? Want to split a Big Gulp of WTF? Known variously as crying, hide-'n-seek or time-out dolls, this phenomenon can only be found at American car shows, usually but not exclusively around Detroit metal. The dolls are always leaning face first against the car, and often wear outfits that match whatever they're leaning against. They've been around long enough that some other collectors make their own versions. The only two explanations I've heard that make any sense? One is that the dolls can be used to hide flaws in the car — which is interesting, but sounds wrong, since they're almost always on the front bumper. The more plausible hypothesis: The dolls let wives of the collectors take part in their husbands' hobby. If you have a better explanation, please share it below.